Choose recipient ...FRITSCH GmbH Bakery machines and linesAbteilung Marketing Please choose a recipient. The FRITSCH Group with its headquarters in the Lower Franconian town of Markt Einersheim is a pioneer in the production of high-quality bakery machines for the sheeting and processing of dough. The company was founded in 1926, has been family-owned for four generations and now has more than 600 employees. 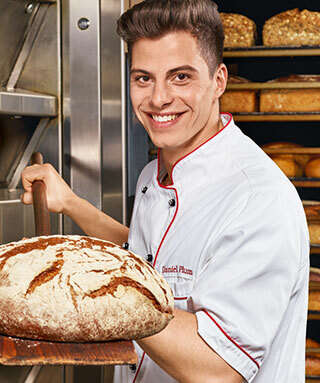 Its passion for the dough and the technology encourages FRITSCH to supply high-quality, efficient lines and services to its customers – from the artisan baker to the industrial baker – always in line with its "Passion for Dough" policy. From its manual sheeting machine through to its highly efficient industrial line, FRITSCH offers pioneering innovation and service to its customers in all performance classes, even project engineering of complete turnkey plants. FRITSCH is represented by subsidiaries in Russia, Poland, the United States of America and Great Britain, and it has a close relationship with its customers thanks to 50 international sales and service partners. FRITSCH runs an extremely modern 4,600-square-metre technology centre for research purposes and for its customers.